So The Legal Genealogist is chasing ancestors through the courthouses of Texas this week, and ran into something yesterday that was just a little surprising. It shouldn’t have been, really — the telltale signs really are there — but it was still a little surprising. You see, my favorite ancestor George Washington Cottrell — my scoundrel who managed to get himself indicted a half dozen times or so, the last time for murder1 — lived in Colorado County, Texas, in the 1840s. That’s where he was first shows up in the Texas record books. He was married there in 18422, to a widow named Mary Gilbert, and was promptly indicted for bigamy and adultery there.3 The charges were dismissed after Wharton County was created from Colorado County,4 and we’d long thought that it was perhaps because it was no longer Colorado County’s problem and perhaps because the woman he married in 1842 died5 and he was no longer — if he ever had been — a bigamist. Except yesterday I discovered that what’s on microfilm isn’t quite what it’s cracked up to be. 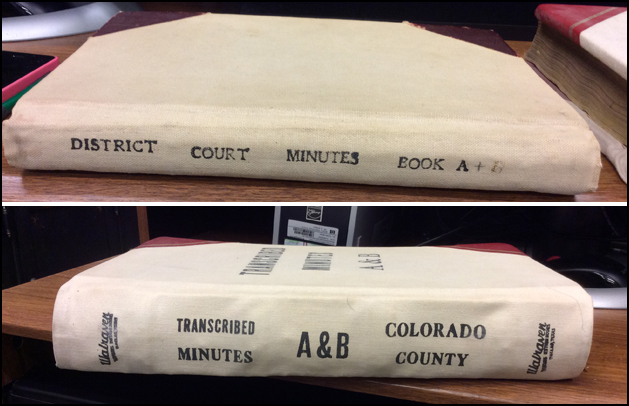 Oh it reads Minutes, volume AB, for sure, just as the microfilm version does. But there’s a word on the book in the Colorado County District Court Clerk’s Office that isn’t in the film description. Carefully and neatly copied, many years later, by a later and different court clerk. Now in George’s particular case the entry in the original book, which still exists there in Columbus, Texas, reads exactly the same as the entry in the transcribed book. But looking at the original volume it’s an absolutely safe bet that that may not be true for every entry in that book. The handwriting essentially guarantees that some things that made it into the transcription may not be exactly what was written the first time around. All of which goes to point out why we all say, over and over and over, it’s so important to get out to the courthouses and libraries and repositories where the original records are located. It’s not even all on microfilm. And sometimes, as in Colorado County, what’s on microfilm isn’t even what was originally written. Thanks Judy. We cannot stress this enough. Especially in our era of online records and all the new people delving into genealogy. Too many people think it’s all online now. Nope nope nope. Very interesting point – amazing that the microfilm being of the transcribed records. I usually check the beginning of any microfilm to see if it shows the covers of the book and/or the title page(s). It’s only the outside of the book that says it’s transcribed, Celia, and a note tucked way back in the very back of the book. And squashed versus quashed still makes me smile. And then there are the RESTORED records of Hamilton County, Ohio. Seems that there were numerous fires, including the one from the 1884 riot that consumed the civil records of my grandparent’s 1850 marriage. The FHL description for the microfilm of these records indicates that they are “Restored.” These images are now at FamilySearch.org, but the online description does not indicate that they are not the originals. Fortunately, the ST. MATTHAEUS GERMAN EVANGELICAL CHURCH RECORDS survived and are on FHL microfilm. “Restored” (or “transcribed”) is surely better than “lost forever and ever amen” — but I’d always want to know what’s original and what’s not. Always try to find the original. I had found an obituary in the local paper where a relative was buried. After searching for a related person to the deceased, I came across the original obituary, which actually occurred in the actual state where the person actually died, ie not the home town obituary which had been truncated. It contained another 2 paragraphs of personnal family details which scattered a brink wall of 5 years for me. Good for you for following through, Paul!